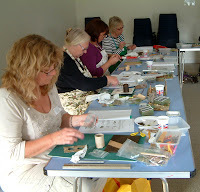 Nostalgia In Miniature Workshops: What A Fabulous Day & What A Generous Bunch Of Ladies!!!! What A Fabulous Day & What A Generous Bunch Of Ladies!!!! 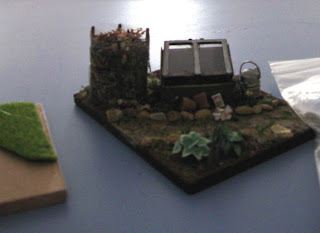 Last Sunday, on yet another nice sunny afternoon - we held the third workshop featuring our imaginary little old cottage garden. 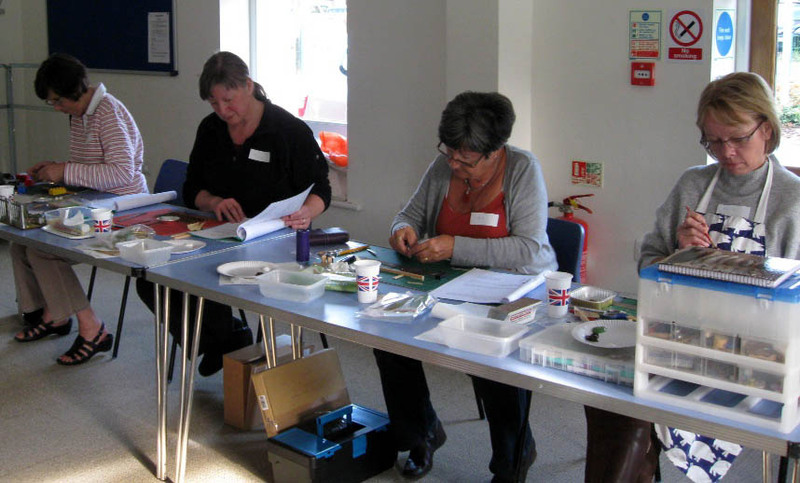 The participants were creating the 'Over the Little Garden Fence' project, apart from a couple of ladies who were embarking on the 'Down the Little Garden Path' project. It's never possible to pick the perfect date that suits everyone, so we were happy to reprise these workshops for those that missed it first time around. 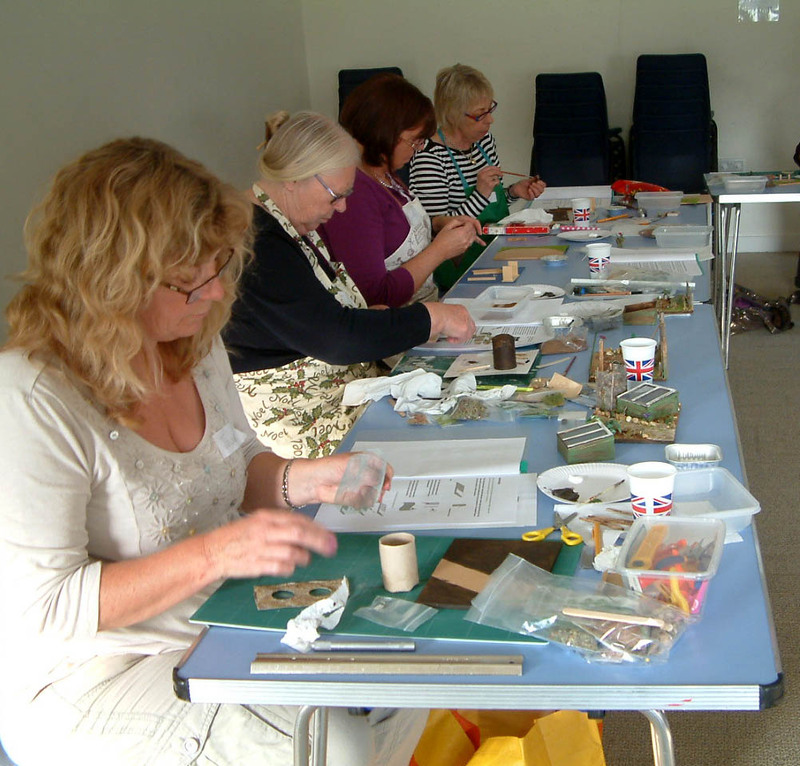 It was a delight to welcome some new participants and of course welcome back several ladies who had been before. 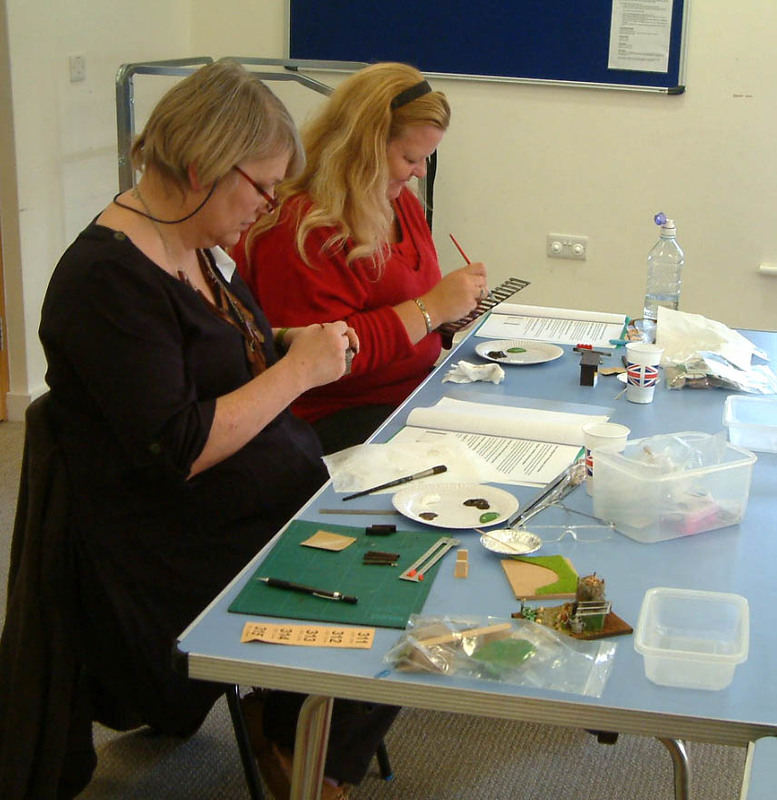 They were a lovely, lively and hardworking bunch who all contributed to a very friendly and relaxed atmosphere. 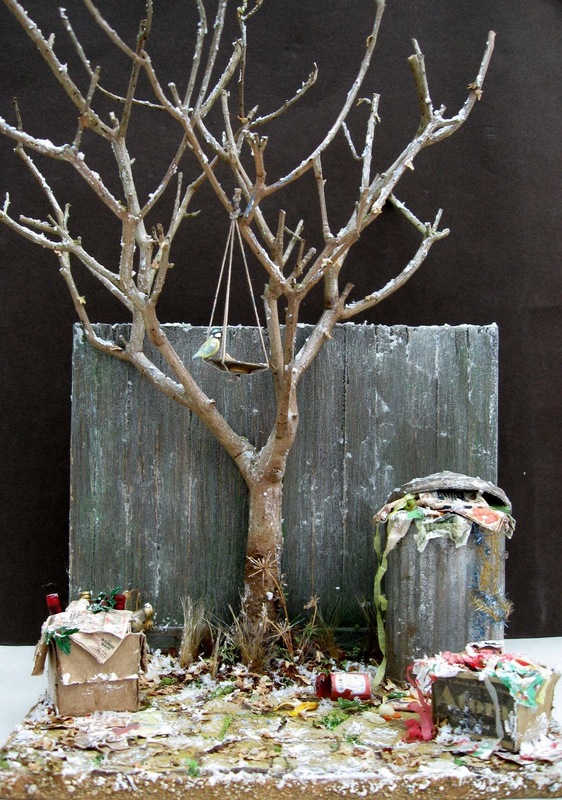 Janine's "Down The Little Garden Path" project made at September's workshop. What was especially nice was that a number had brought along their first projects, each with their own individual additions to the prototype, so they could tie them in to the second project, (above is Janine's which you can just about see in this photo)! In fact this was the original photo...hahahaha...Celia thought that Robin was just taking a photo of Janine's project....but in reality Robin liked the way the sun was shining through the window....giving Celia a kind of halo!!! One of our main aims for these workshops is for participants to learn some new skills and are encouraged to use them in order to create their very own scenes....so is extremely pleasing for us to see this all being put into practice. 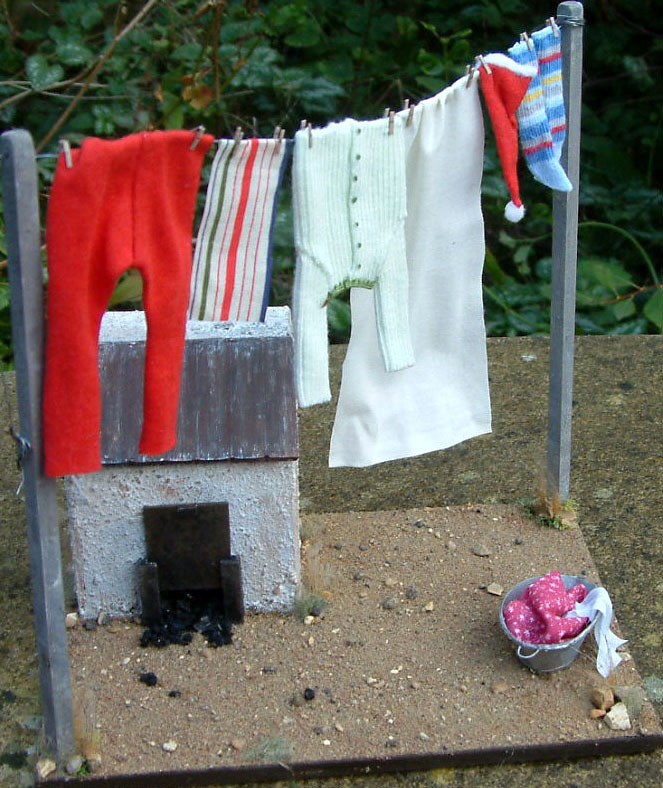 We 'unveiled' 'The Little Old Washing Line' project ( which is our next workshop on November 27th), complete with an ancient coal bunker and Santa's longjohns hanging up to dry, to much merriment and a flurry of booking forms. Thank you ladies!! And now to the fund raising.....we are chuffed to announce that the total raised at last Sunday's workshop for Breast Cancer Campaign was £38.50. Thank you ladies for being so generous with the raffle and the refreshment donations!!!!! So once again, thank you everyone for your generosity. After the November workshop (which will be the last for 2011) we will send a cheque off to the charity. We also had our first opportunity to show off in public our little 1/12th scale scene - "A Frosty Morning...After the Night Before". Thank you ladies for being so complementary.....we were actually a little nervous on the unveiling....(yes honestly)!!! This is to be featured in the Dolls House and Miniature Scene Magazine - January and February 2012 issues. And as you will all know by now if you have seen our workshop website and the little video, it is now up for sale in The Sealed Bid Auction to raise funds for Breast Cancer Campaign. Just a reminder that you can bid now online or by post.